Write something here about the sculpture at Saint Joseph Medical Center. Danni Dawson received her BA and MFA degrees from George Washington University and apprenticed with Nelson Shanks. 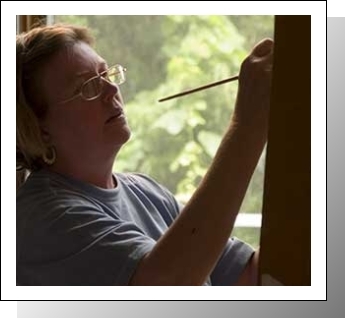 A professional artist and teacher for over 25 years, Danni has exhibited her paintings nationally and internationally, and has received many awards including the Allied Artist Award, the Salmagundi Painting Prize, the Audubon Award, and an award for painting from the National Academy of Art and Design. Her work has also been featured in American Artist. With over 300 portraits to her credit, Danni Dawson has painted heads of state, dignitaries, and university officials as well as senior members of the military and medical communities. Her portraits and still lifes are displayed in collections throughout the world. Danni's 17 ft. bronze sculpture "St. Joseph, the Worker," commissioned for the facade of Towson, Maryland's St. Joseph's Hospital, was dedicated in December 2008. 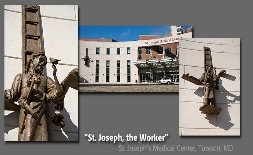 See WBAL-TV's video of the opening of the new St. Joseph Medical Center facility showing both the large sculptures on the facade, and the small bronze in the meditation garden, and additional photos and information at the St. Joseph's Hospital website.